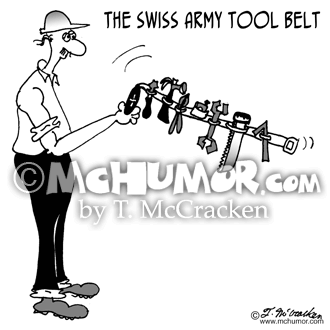 Hardware Cartoon 6148: A carpenter flipping open "The Swiss Army Tool Belt" that has hammers, saws, and screwdrivers coming out of a tiny knife. 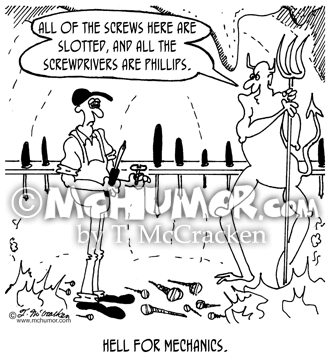 Repair Cartoon 7357: "Hell for Mechanics." The Devil shows a man a flaming cave with lots of tools, and says, "All of the screws here are slotted, and all the screwdrivers are Phillips." 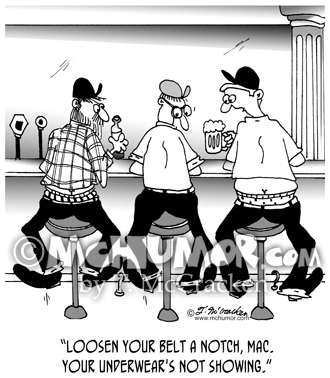 Hardware Cartoon 6416: A bunch of carpenters sitting at a diner counter with their underwear showing because their tool belts are pulling their pants down. 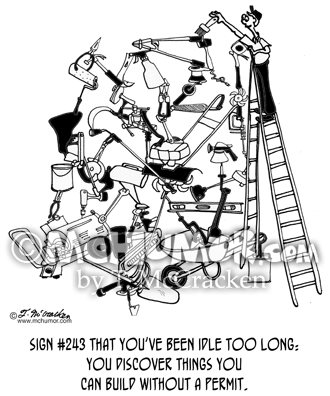 To one they say, "Loosen your belt a notch, David. Your underwear's not showing." 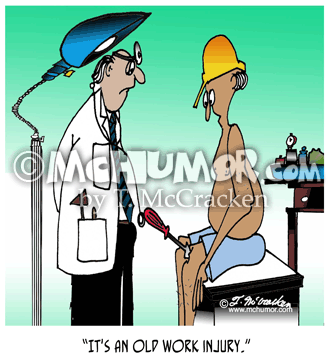 Safety Cartoon 4247: A man with a screwdriver in his knee saying to a doctor, "It's an old work injury." 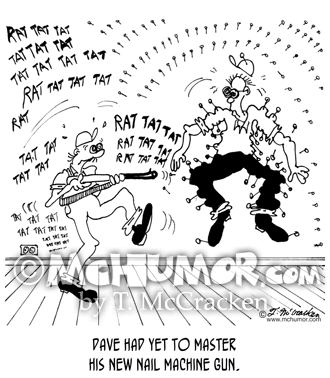 Carpenter Cartoon 6428: "Dave had yet to master his new nail machine gun." 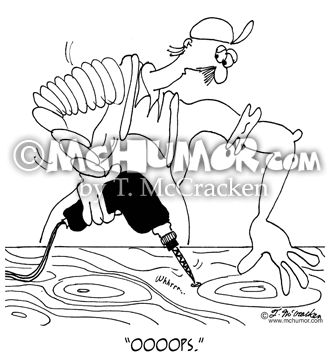 A carpenter's nail gun fires so often that he's nailed an assistant to the wall. 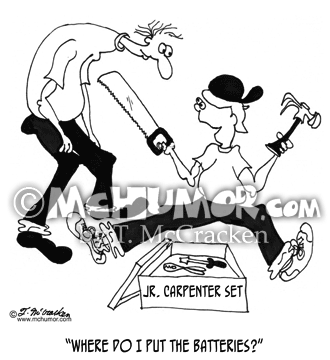 Carpenter Cartoon 6662: A kid getting a Jr. Carpenter Set with a hammer, saw and a screw driver asks, "Where do I put the batteries?" 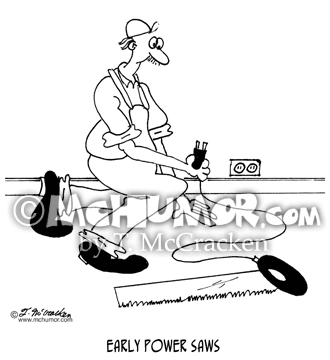 Carpenter Cartoon 6431: "Early Power Saws." A carpenter plugs in hand saw with an electric cord. 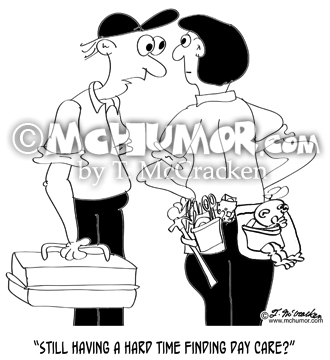 Carpenter Cartoon 8690: Someone asks a carpenter with a baby in his tool belt, “Still having a hard time finding day care?"